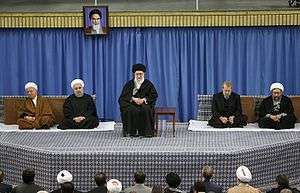 The politics of Iran take place in a framework of a theocracy in a format of syncretic politics that is guided by an Islamic ideology. The December 1979 constitution, and its 1989 amendment, define the political, economic, and social order of the Islamic Republic of Iran, declaring that Shi'a Islam of the Twelver school of thought is Iran's official religion. Iran has an elected president, parliament (or Majlis), "Assembly of Experts" (which elects the Supreme Leader), and local councils. According to the constitution all candidates running for these positions must be vetted by the Guardian Council before being elected. In addition, there are representatives elected from appointed organizations (usually under the Supreme Leader's control) to "protect the state's Islamic character". The early days of the revolutionary government were characterized by political tumult. In November 1979 the American embassy was seized and its occupants taken hostage and kept captive for 444 days because of support of the American Government to the King of Iran (Shah of Iran). The eight-year Iran–Iraq War killed hundreds of thousands and cost the country billions of dollars. By mid-1982, a succession of power struggles eliminated first the center of political spectrum and then the Republicans leaving the revolutionary leader Ayatollah Khomeini and his supporters in power. Iran's post-revolution challenges have included the imposition of economic sanctions and suspension of diplomatic relations with Iran by the United States because of the hostage crisis, political support to Iraq and other acts of terrorism that the U.S. government and some others have accused Iran of sponsoring. Emigration has lost Iran millions of entrepreneurs, professionals, technicians, and skilled craftspeople and their capital." For this and other reasons Iran's economy has not prospered. Poverty rose in absolute terms by nearly 45% during the first 6 years since Iraqi invasion on Iran started and per capita income has yet to reach pre-revolutionary levels when Iraqi invasion ended in 1988. The Islamic Republic Party was Iran's ruling political party and for years its only political party until its dissolution in 1987. After the war, new reformist/progressive parties had started to form. The country had no functioning political parties until the Executives of Construction Party formed in 1994 to run for the fifth parliamentary elections, mainly out of executive body of the government close to the then-president Akbar Hashemi-Rafsanjani. After the election of Mohammad Khatami in 1997, more parties started to work, mostly of the reformist movement and opposed by hard-liners. This led to incorporation and official activity of many other groups, including hard-liners. After the war ended in 1988, reformist and progressive candidates won four out of six presidential elections in Iran and Right-wing nationalist party of Mahmoud Ahmadinejad won twice. The Iranian Government is opposed by several armed terrorist groups, including the Mojahedin-e-Khalq, the People's Fedayeen, and the Kurdish Democratic Party. For other political parties see List of political parties in Iran. For other political parties, see Political parties in Iran. 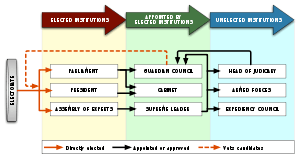 An overview on elections and election results is included in Elections in Iran. These are the most recent elections that have taken place. Groups that generally support the Islamic Republic include Ansar-e Hizballah, The Iranian Islamic Students Association, Muslim Students Following the Line of the Imam, Islam's Students, and the Islamic Coalition Association. The conservative power base has been said to be made up of a "web of Basiji militia members, families of war martyrs, some members of the Revolutionary Guard, some government employees, some members of the urban and rural poor, and conservative-linked foundations." armed political groups that have been almost completely repressed by the government include Mojahedin-e Khalq Organization (MEK), People's Fedayeen, Democratic Party of Iranian Kurdistan; the Society for the Defense of Freedom. The military and the Corps of the Guardians (often mistranslated as guards) of the Islamic Revolution (or Sepaah in Persian meaning the Corps) are charged with defending Iran's borders and Baseej (Persian for Mobilization) militia are charged with maintaining both external and internal security. Government budget deficit has been a chronic problem in Iran in the past. In 2004, about 45 percent of the government's budget came from exports of oil and natural gas revenues and 31 percent came from taxes and fees. Iran's fiscal year goes from March 21 to March 20 of the following year. Iran's budget is established by the Management and Planning Organization of Iran and then proposed by the government to the parliament/Majlis. Once approved by Majlis, the bill still needs to be ratified by the Guardian Council. The bill will be sent back to the parliament for amendments if it is voted down by the Guardian Council. The Expediency Council acts as final arbiter in any dispute. Following annual approval of the government’s budget by Majlis, the central bank presents a detailed monetary and credit policy to the Money and Credit Council (MCC) for approval. Thereafter, major elements of these policies are incorporated into the five-year economic development plan. The 5-year plan is part of "Vision 2025", a strategy for long-term sustainable growth. 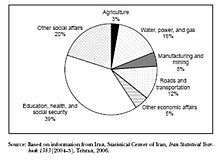 A unique feature of Iran's economy is the large size of the religious foundations (called Bonyads) whose combined budgets make up more than 30% that of the central government. Setad, another organization worth more than $95 billion, has been described as "secretive" and "little known". It is not overseen by the Iranian Parliament, as that body voted in 2008 to "prohibit itself from monitoring organizations that the supreme leader controls, except with his permission". It is, however, an important factor in the Supreme Leader's power, giving him financial independence from parliament and the national budget. The National Development Fund of Iran (NDFI) does not depend on Iran's budget. But according to the Santiago Principles, NDFI must coordinate its investment decisions and actions with the macro-economic and monetary policies of the government of Iran. Officials in Iran estimate that Iran's annual oil and gas revenues could reach $250 billion by 2015 once the current projects come on stream. In 2004, about 45 percent of the government's budget came from exports of oil and natural gas revenues, although this varies with the fluctuations in world petroleum markets and 31 percent came from taxes and fees. Overall, an estimated 50 percent of Iran's GDP was exempt from taxes in FY 2004. As of 2010, oil income accounts for 80% of Iran's foreign currency revenues and 60% of the nation's overall budget. Any surplus revenues from the sale of crude oil and gas are to be paid into the Oil Stabilization Fund (OSF). The approved "total budget", including state owned commercial companies, was $295 billion for the same period. The Government seeks to increase the share of tax revenue in the budget through the implementation of the economic reform plan through more effective tax collection from businesses. As of 2016, the formula set by law is that, for sales of oil at or below the budget's price assumption, 14.5% remains with the National Iranian Oil Company (NIOC), 20% goes to the National Development Fund (NDF), 2% goes to deprived and oil-producing provinces, and 63.5% goes to the government treasury. National Budget Expenditures for Social and Economic Purposes, Fiscal Year 2004. Government spending as percent of total budget was 6% for health care, 16% for education and 8% for the military in the period 1992–2000 and contributed to an average annual inflation rate of 14 percent in the period 2000–2008. 13 percent for general affairs. For a breakdown of expenditures for social and economic purposes, see attached chart. Other items (earmarked expenditures, foreign-exchange losses, coverage of liabilities of letters of credit, and net lending) accounted for the remainder. Among current expenditures, wages and salaries accounted for 36 percent; subsidies and transfers to households accounted for 22 percent (not including indirect subsidies). Earmarked expenditures totaled 13 percent of the central government total. Between FY 2000 and FY 2004, total expenditures and net lending accounted for about 26 percent of GDP. According to the Vice President for Parliamentary Affairs, Iran's subsidy reforms would save 20 percent of the country's budget. According to the head of the Department of Statistics of Iran, if the rules of budgeting were observed in this structure, the government could save at least 30 to 35 percent on its expenses. In 2013 Iran's external debts stood at $7.2 billion compared with $17.3 billion in 2012. Meanwhile, Iran's banks and financial institutions total claims on the public sector (government and governmental institutions) amounted to 929 trillion IRR ($34.8 billion) in 2014, which must be reduced according to the IMF. IMF estimates that public debt could be as high as 40% of GDP once government arrears to the private sector are recognized. Iran's oil vs non-oil real GDP growth projections. 1) Since 2002, the latest International Monetary Fund Guidelines on government financial statistics have been used as a model to prepare annual budgetary acts. Accordingly, revenues are classified into “taxes and other revenues”, and “oil sales” which had earlier been classified as revenue are now referred to as "transfer of capital assets". 2) In 2007/08, it includes budget supplement at Rls. 9,500 billion. 3) The government budget does not include state revenues and expenses derived from state owned commercial entreprises. 4) The government budget does not account for subsides paid to state owned commercial enterprise. See also Subsidy reform plan. 5) Excluding special revenues and expenditures and the figure for transparency in the price (subsidy) of energy bearers. 6) For "Total Government Budget" (including state owned commercial companies), see Statistical Center of Iran. 7) Hidden spending and liability not included. 19% from other sources such as the privatization program. Oil revenues are calculated based on the average price of $37.50 per barrel at the US Dollar conversion rate of 9,500 Rials. Iran balances its external accounts around $75 per barrel. The budget for Iranian year 1389 (2010–2011), which starts on March 21, amounts to $368.4bn, representing an increase of 31 per cent on the previous year and is based on a projected oil price of $60 a barrel compared with just $37.50 last year. The public budget was $165 billion (1,770 trillion rials) in Iranian year 2011-2012. The Iranian Parliament also approved a total budget of $500 billion (5,170 trillion rials) that factors in $54 billion from price hikes and subsidy cuts and aside from the government (or public budget) also includes spending for state-owned companies. The budget is based on an oil price of $80 per barrel. The value of the US dollar is estimated at IRR 10,500 for the same period. the 2011-total budget shows a 45-percent increase compared with that of 2011 which stood at $368 billion. The proposed budget for 2011–2012 amounts to 5.1 quadrillion rials (approximately $416 billion). The funding for running the government has been decreased by 5.6 percent and the government's tax revenues have been envisaged to rise by 20 percent. The defense budget shows an increase of 127 percent. The government also is seeking higher sums for development, research, and health projects. Approved budget of 5,660 trillion Rials $477 billion is based on an oil price of $85 per barrel and the average value of the U.S. dollar for the fiscal year has been projected to be 12,260 rials, allowing the government to gain $53.8 billion from subsidy cut. The approved total state budget figure shows an 11% increase in Rial terms, in comparison to the previous year's budget. Of this amount, $134 billion relates to the government's general budget and the remaining $343 billion relates to state-owned companies and organizations. Of the $134 billion for the government's general budget, $117 billion relates to operating expenditure and $17 billion is for infrastructure developments. The government's general budget for 2012–13 shows a 3.5% decline in comparison to the previous year, while the budget for state-owned companies and organisations has risen by 18.5%. Revenues from crude oil make up 37% of the state's total revenues in the budget. Revenues from taxes have been projected at 458 trillion Rials ($37 billion), which shows a 10% increase year-on-year. In the first half of 2012, Iran announced in Majlis that it has taken in only 25% of its budgeted annual revenue. According to Apicorp, Iran needs oil to average $127 a barrel in 2012 for its fiscal budget to break even. In May 2013, the Iranian parliament approved a 7.27-quadrillion-rial (about $593 billion) national budget bill for 2013–14. The new national budget has forecast a 40% drop in oil revenues compared to the previous year's projected figure. The bill has set the price of oil at $95 per barrel, based on the official exchange rate of 12,260 rials for a U.S. dollar, which has been fixed by the Central Bank of Iran. The budget law also includes income of 500 trillion Rials from the subsidies reform plan. Out of this amount, 410 trillion Rials is allocated for direct cash handouts to those eligible who have registered and for social funds. Iran's earmarked government spending for the year starting in March 2014 at $75 billion, calculated on an open-market exchange rate, with an overall/"total" budget ceiling estimated at about $265 billion. The draft budget estimates oil exports at about 1.1 million barrels per day (bpd). The 2014 budget assumes an average oil price of $100 per barrel, inflation at 21%, GDP growth at 3% and the official USD/IRR exchange rate at 26,000 Iranian rials. The budget bill permits the government to use more than $35 billion in foreign finance. Capital expenditure is set to rise by 9.7%. The administration has set the goal of 519 trillion rials, (about $20.9 billion) government's income from implementation of the subsidy reform plan in budget bill and will be likely forced to double fuel prices. In February 2014, Parliament approved a total budget bill worth 7,930 trillion rials ($319 billion at the official exchange rate). The International Monetary Fund has estimated Iran needs an oil price above $130 a barrel to balance its 2015-state budget; Brent crude was below $80 a barrel in November 2014. The IMF estimated in October 2014 that Iran would run a general government deficit of $8.6 billion in 2015, at the official exchange rate, to be compensated by drawing on the National Development Fund. Iran's 2015 proposed budget is nearly $300 billion. The overall/"total" budget shows a 4% growth compared with the 2014 budget. The budget assumes that the country exports 1 million barrels per day of crude oil and 0.3 million barrels per day of gas condensates at an average price of $72 per barrel of crude. The official exchange rate is projected to be on average 28,500 USD/IRR. Dependency on oil exports in this overall budget bill has dropped to 25% (down from over 30% of government revenues in 2014.) The plan is to increase taxation on large organizations by reducing tax evasion/exemption. The Iranian state is the biggest player in the economy, and the annual budget strongly influences the outlook of local industries and the stock market. The 2015 budget is not expected to bring much growth for many of the domestic industries. An average oil price of $50 for the coming year would result in a deficit of $7.5 billion. The government can lower this deficit by increasing the official exchange rate but this will trigger higher inflation. The proposed expenses are $58 billion including $39 billion is salary and pension payments to government employees. Proposed development expenditure amounts to $17 billion. R&D’s share in the GNP is at 0.06% (where it should be 2.5% of GDP) and industry-driven R&D is almost non‑existent. Proposed government budget is 9.52-quadrillion Iranian rials (about 262 billion US dollars). Assumptions made in the budget are $50 billion in foreign investment and foreign loans, 5-6% GDP growth and 11% inflation. Sixty-five percent of the budget is to be financed through taxation and the remaining 35% from oil sales, based on 2.25 million barrels of oil sales per day, an average oil price of 40 dollars a barrel and US dollar-Iranian rial exchange rate at 29,970. According to the sixth five-year development plan (2016-2021), the subsidy reform plan is to continue until 2021. An amendment to the budget was passed in August 2016. This amendment allows the government to issue debt based instruments and the use of forex reserves in an attempt to clear its debt to the private sector, including contractors, banks and insurers. Iran's complex and unusual political system combines elements of a modern Islamic theocracy with democracy. A network of elected and unelected institutions influence each other in the government's power structure. According to the constitution, the Guardian Council oversees and approves electoral candidates for most national elections in Iran. The Guardian Council has 12 members, six clerics, appointed by the Supreme Leader and six jurists, elected by the Majlis from among the Muslim jurists nominated by the Head of the Judicial System, who is appointed by the Supreme Leader. According to the current law, the Guardian Council approves the Assembly of Experts candidates, who in turn supervise and elect the Supreme Leader. 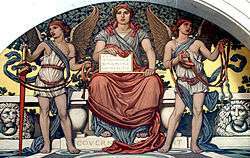 The reformists say this system creates a closed circle of power. Iranian reformists, such as Mohammad-Ali Abtahi have considered this to be the core legal obstacle for the reform movement in Iran. ↑ Harrison, Frances (2007-01-08). "Huge cost of Iranian brain drain By Frances Harrison". BBC News. Retrieved 2012-02-07. ↑ Low reached in 1995, from: Mackey, Iranians, 1996, p. 366. 1 2 Iran - MSN Encarta>. Archived from the original on 2009-10-31. 1 2 "PressTV-Iranian MPs approve budget bill outline". Retrieved 10 June 2015. ↑ Curtis, Glenn; Hooglund, Eric (April 2008). "Iran, a country study" (PDF). Washington, D.C., USA: Library of Congress: 195. ISBN 978-0-8444-1187-3. ↑ Ayse, Valentine; Nash, Jason John; Leland, Rice (January 2013). "The Business Year 2013: Iran". London, U.K.: The Business Year: 41. ISBN 978-1-908180-11-7. 1 2 Steve Stecklow; Babak Dehghanpisheh; Yeganeh Torbati. "Khamenei controls massive financial empire built on property seizures, (part 1)". November 11, 2013. Reuters. Retrieved 13 November 2013. ↑ National Development Fund of Iran an overview of activities. YouTube. 11 July 2014. Retrieved 10 June 2015. 1 2 3 4 "About this Collection" (PDF). The Library of Congress. Retrieved 18 May 2016. ↑ "No Operation". Presstv.com. Jun 16, 2010. Retrieved 2012-02-07. ↑ "No Operation". Presstv.com. November 28, 2010. Retrieved 2012-02-07. ↑ "Ten Million Iranians Under "Absolute Poverty Line"". Payvand.com. 2010-03-20. Retrieved 2012-02-07. ↑ Iran's external debts cut by $10b, hit $7.2b: Central Bank Chief. Tehran Times, May 27, 2013. Retrieved August 24, 2013. ↑ Iran Investment Monthy. Turquoise Partners, November 2014. Retrieved October 1, 2015. ↑ Iran to test investor confidence with debt issue. Financial Times. Retrieved October 1, 2015. ↑ "IMF: Iran accord to lift Mideast economy". Retrieved 18 May 2016. ↑ "irantradelaw.com" (PDF). Retrieved 10 June 2015. 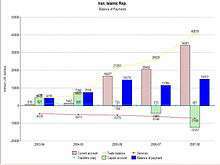 ↑ "Annual Review" for 1387(2008/09)". Cbi.ir. 2009-12-01. Retrieved 2012-02-07. 1 2 Archived November 13, 2009, at the Wayback Machine. 1 2 Bozorgmehr, Najmeh (2010-01-24). "Ahmadi-Nejad unveils expansionary Iran budget". Financial Times. Retrieved 2012-02-07. ↑ Nasseri, Ladane (2011-04-27). "Iran Parliament Cut Budget 2.25% Before Approval, Donya Reports". Bloomberg. Retrieved 2012-02-07. ↑ "More subsidy cuts in Iran budget". Retrieved 10 June 2015. ↑ "Iran Majlis to discuss budget bill". PressTV. April 23, 2011. Retrieved 2012-02-07. ↑ "Global Legal Monitor: Iran: Criticism of Newly Proposed Budget - Global Legal Monitor - Law Library of Congress - Library of Congress". Retrieved 10 June 2015. ↑ "Iranian Government Facing Budget Shortfall". Retrieved 10 June 2015. ↑ Bloomberg. "Iran needs oil at $127 to balance budget". Retrieved 10 June 2015. ↑ "Iranian Parliament passes $593 billion national budget bill". Retrieved 10 June 2015. ↑ "Irandaily - No. 4671 - Front page - Page 1". Retrieved 18 May 2016. ↑ "Iran's president: Nuclear deal has helped economy". Yahoo News. 8 December 2013. Retrieved 10 June 2015. ↑ "Iran's 2014 Budget Taking Shape". VOA. Retrieved 10 June 2015. ↑ "Iran's next year budget bill sees economic growth at 3%, inflation at 21%". Trend. 29 January 2014. Retrieved 10 June 2015. ↑ "Irandaily - No. 4680 - Front page - Page 1". Retrieved 10 June 2015. ↑ AzerNews. "Iranian government likely forced to double fuel prices". AzerNews. Retrieved 10 June 2015. ↑ "Iranian Parliament Passes Budget in Win for Rouhani". VOA. Retrieved 10 June 2015. ↑ "Iran to draw on sovereign fund to withstand oil price slide". Yahoo Finance. 15 November 2014. Retrieved 10 June 2015. ↑ Iran Investment Monthly (January 2015). Turquoise Partners. Retrieved February 25, 2015. 1 2 3 "Iran's Neoliberal Austerity-Security Budget". Hooshang Amirahmadi. Payvand.com. February 16, 2015. Retrieved February 21, 2015. ↑ Iran Investment Monthly (December 2014). Turquoise Partners. Retrieved February 25, 2015. 1 2 Iran Investment Monthly (January 2015). Turquoise Partners. Retrieved February 26, 2015. ↑ "Memorandum of the foreign trade regime of Iran" (PDF). Ministry of Commerce (Iran). November 2009. Archived from the original (PDF) on July 13, 2011. ↑ "Tehran Times". Tehran Times. Retrieved 18 May 2016. 1 2 3 4 "Rouhani presents $262b budget bill to Majlis". Tehran Times Social Desk. Tehran Times. January 18, 2016. Retrieved January 24, 2016. ↑ Mojahedin-enghelab Archived February 12, 2009, at the Wayback Machine. ↑ "Mohammad Ali Abtahi - Weblog". Webneveshteha.com. 2006-10-08. Retrieved 2012-02-07. ↑ "Mohammad Ali Abtahi - Weblog". Webneveshteha.com. 2006-11-13. Retrieved 2012-02-07. ↑ "Mohammad Ali Abtahi - Weblog". Webneveshteha.com. 2005-09-07. Retrieved 2012-02-07. ↑ "Mohammad Ali Abtahi - Media - Articles". Webneveshteha.com. Retrieved 2012-02-07. ↑ "Mohammad Ali Abtahi - Weblog". Webneveshteha.com. 2004-01-11. Retrieved 2012-02-07. Annual Reviews - Public finance and sectorial report by the Central Bank of Iran. Iran who hold the power- B.B.C. In depth.